As a responsible and caring parent, your child’s well-being is foremost on your mind. Car seats play a very important role in keeping your child safe in one of the most dangerous activities they will ever be a part of: riding in a car. Automobile injuries are the leading cause of death for American children (http://www.cdc.gov/ncipc/factsheets/childpas.htm). A recent report, released by the American Academy of Pediatrics and based primarily off of a 2007 study by the University of Virginia, showed that children under two years of age are 75% less likely to sustain a severe injury in a car accident if they are in a rear facing position. Most parents, as well as daycare centers and private daycares, currently use age as their primary factor when determining how and if a child should be restrained in a car seat. Previous to this study, it was recommended that a child should be in a rear-facing car seat until the age of one year. 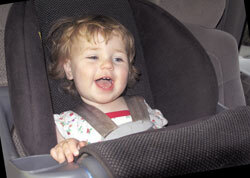 At one year of age, many children’s car seats are turned around so they can face forward. Turning the child’s car seat around was often a major milestone for parents. This new study and the suggestion of the American Academy of Pediatrics indicate children are much safer if they are kept in a rear-facing position for one more year. Though the convenience of turning your child around to face forward is tempting, we would urge you to follow the new recommendation. The rear-facing position is much safer for your child in a car accident because their entire body is supported during a crash. Keeping your child in a rear-facing position might even help you avoid crashes since you’ll be less inclined to take your attention from the road by turning around to look at your child. Since driving is such a normal part of our lives, it’s easy to forget how dangerous it is. Driving is one of the most dangerous things we do, so as responsible parents we need to be sure we are taking every precaution while driving to make sure we are being as safe as possible. It’s important to address these new findings with your daycare provider. It is likely they already know about them, but it is important to make sure. You may want to ask what kind, if any, policy changes they will be making. Be sure that they are being as safety-minded as any other responsible adult. If your daycare provider drives your child anywhere, it is important to know how they are doing this and that they are keeping up with all modern safety precautions. Be sure to also check what kind of car seat they are using for your child. Make sure the car seat is installed correctly and facing the right way. Your child should have an assigned car seat and it should be adjusted correctly for them. Check to make sure your own accommodations are as safe as possible and that you are setting a good example by wearing your seat belt and talking with your children about car safety. If you teach your children about car safety they can and will police themselves. They may tell you if they did something dangerous or were not strapped in for a short trip. Remember, as a responsible parent your job is to make sure your child is as safe as possible. It is your responsibility to speak to your daycare provider, change your own habits or inform your nanny of the changes in care for the safety of your child. Make sure you do what you can to ensure a long, happy and healthy life for you and your children.